Change.org's mission is "to empower people everywhere to create the change they want to see." Any person from around the world can create a petition using the site, making demands for -- you guessed it -- change. Issues brought to the table range from peace initiatives to local government overhauls. Plus better Netflix. Change.org users really need their preferred streaming service to be pristine. 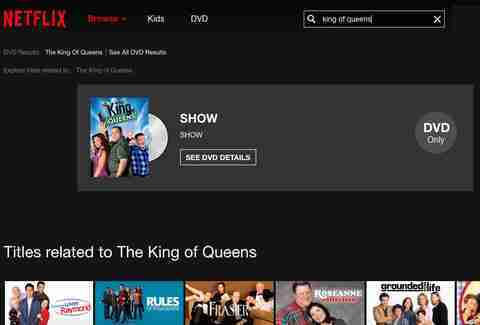 Make the King of Queens available! Argument: "[The King of Queens] is a lighthearted, fun comedy that so many people would love to enjoy in their living rooms at their own convenience..."
Reality check: While Netflix is in the Kevin James business -- it'll distribute his next comedy, The True Memoirs of an International Assassin, later this year -- King of Queens is currently locked in a syndication deal with TBS. 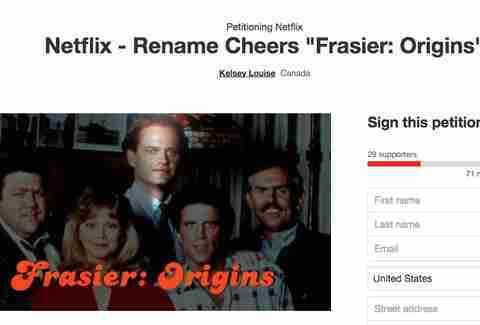 Hopefully 210 episodes of Everybody Loves Raymond can help these petitioners deal. Create a Star Wars series starring Darth Maul! Argument: "Darth Zephan and I... are calling you all to sign and make this series come true in spite of being a simple joke." Reality check: An April Fool's joke becomes the fuel for fan dreams. It's not out of the realm of possibility -- Disney's Marvel properties are dominating the streaming service and Star Wars is an obvious next step. But maybe not with a prequel character sliced in half and revived as a mechanical spider in the cartoons. Argument: "For years, there has been no reliable way to watch what is, in many people's opinion, the greatest television show ever broadcast." 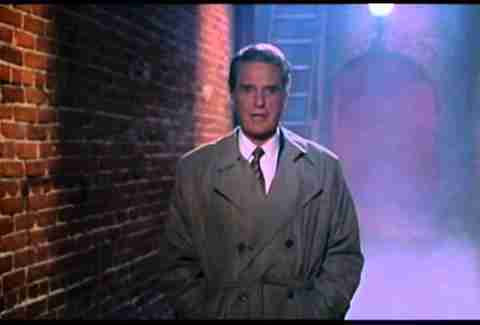 Reality check: The reliable way to watch Unsolved Mysteries is actually 8am Lifetime reruns. Reliable and right: UFO abductions and coffee are part of a balanced breakfast! 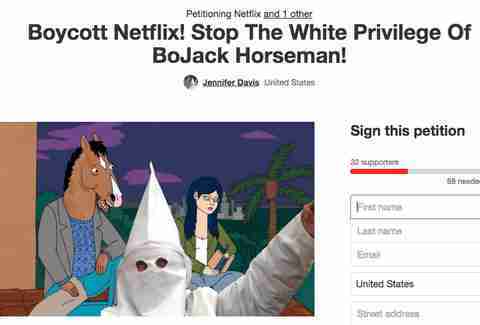 Stop the white privilege of BoJack Horseman! Argument: "The critically acclaimed Netflix show BoJack Horseman tries to hide its racism and white privilege though micro aggressions by being a cartoon. The unflattering title character is a dark-skinned horse." Reality check: I would definitely read a reasoned, level-headed take on this subject. There are very few reasoned, level-headed takes on Change.org. 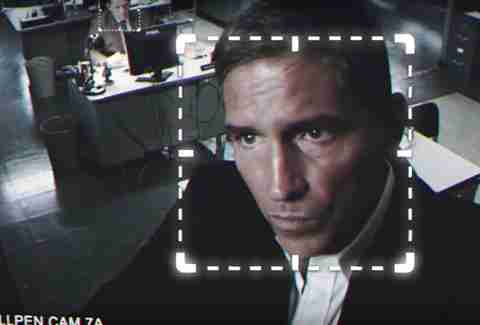 Save Person of Interest (which is still on CBS)! Argument: "We've built great friendships around this show. It entertains us, thrill's us, makes us cry and makes us laugh." Reality check: That Person of Interest, a show I wasn't quite sure was still on TV, has a passionate fandom is a beautiful thing. Does it need saving after five seasons, the final given ample time to send itself off this summer? The fight to "save" the series only begins with this petition; there's also a movement to flood Netflix with custom-made discs and a documentary shedding light on PoI obsessives. There's little chance, but A for effort. 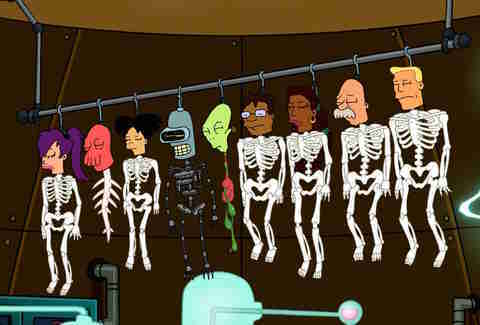 Argument: "[Futurama] was brought back due to the demand for it and we can do that again." Reality check: Not even Dr. Frankenstein was crazy enough to resurrect man twice. Get Andy Warren on Fuller House! Argument: "We want to see Andy Warren, a true fan, on the new Netflix series Fuller House... He is best homies with John Stamos and would love to be reunited!!! Please help to make Andy's dreams come true!!" Reality check: This is very plausible. Ol' Andy is the son of Full House producer Marc Warren. Though if Andy's resorting to petitioning his way into the Fuller House background, maybe "homies" is a bit of a misnomer. Argument: "Anime is very popular and would be beneficial to the company and the subscribers." Reality check: Not enough anime?????? Argument: "Smile Precure is a widely popular anime. Smile Precure is now dubbed and called 'Glitter Force' ... It's Rock paper scissors, not Puppies and kittens! Okynomiyaki is NOT Japanese pizza, it's Japanese pancake. The theme is not makeup and fashion. The theme is smiles and happiness. The transformation is terrible! It's Precure, smile charge! It's Cure March not Glitter Spring! 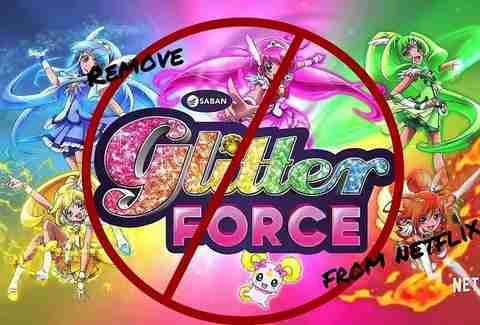 Glitter force truly is a rubbish dub! Miyuki's catchphrase is ultra happy NOT glittertastic!" 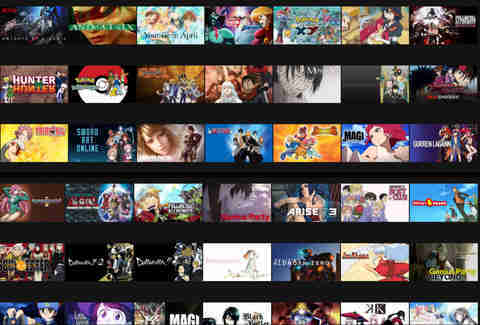 Reality check: Clearly we need more anime on Netflix. Undo the damage of Making a Murderer! 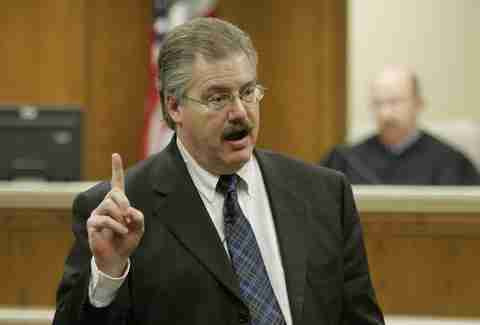 Argument: "Because of your glorious endeavor to create a series aimed to get people thinking about government corruption, Manitowoc County has since been under a great amount of fire." Reality check: The pushback against Netflix's true-crime series is legit and shocking. Shortly after the series dropped, The New York Times examined its negative affects on the small town's reputation and tourism rates. Netflix isn't feeling sympathetic; intentions for Season 2 were quietly announced in February. 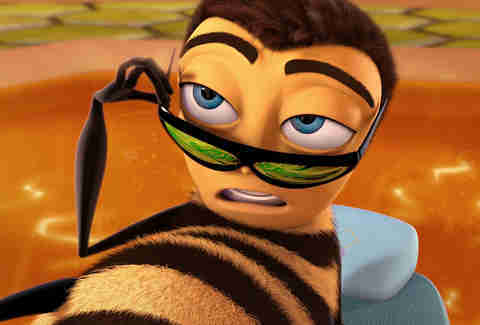 Argument: "I really want the bee movie to be on Netflix"
Reality check: If you can exorcise Jerry Seinfeld of his Bee Movie night terrors, maybe he'll allow it to hit Netflix. 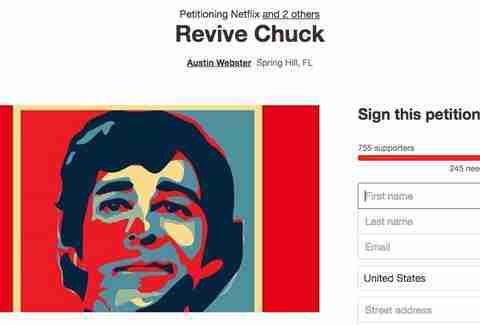 Argument: "Us fans need some closure..."
Reality check: There are approximately 1,000 "Bring back Chuck!" petitions demanding a continuation of the five-season comedy spy series. Fans want to know: did Sarah, Chuck's love interest, gain her memory back? This could all be solved with a tweet, and yet, here we are. Cancel VeggieTales in the House! Argument: "... 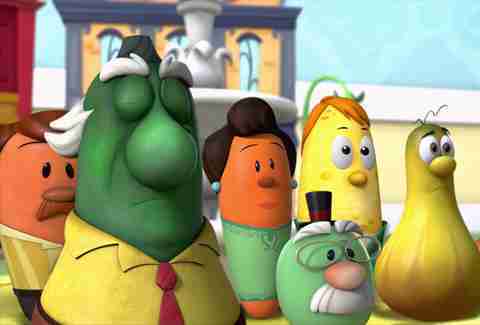 When this show came out the character designs got ruined..."
Reality check: Pray for those harboring VeggieTales nostalgia. 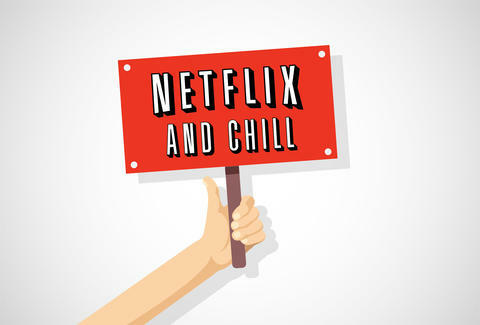 Validate "Netflix and chill" with its own section! Argument: "What better way to spend the evening with a certain someone than with this perfect category?" Reality check: If you can't curate your own frisky programming, you don't deserve to "chill." Argument: "We must act now to rectify this misnomer and encourage all those who know and love the Frasier of "Frasier" to delve further into his background for a deeper understanding of what made Frasier the Frasier he continues to be today..."
Reality check: Signing up immediately. 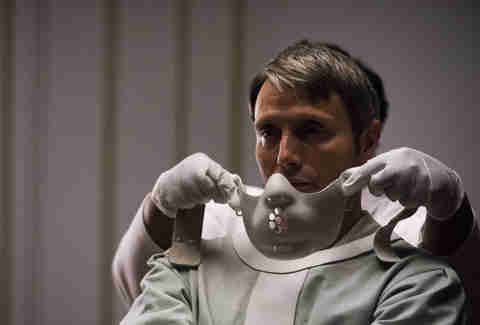 Bring back Hannibal "so we won't have to eat you!" Argument: "Hannibal is not just pure entertainment, but also educational." Reality check: You and I were into this cannibalistic murder mystery for very different reasons, salivating Change.org patron. Argument: "We all miss blockbuster..."
Reality check: Maybe a specific suggestion or two would help, but I like where this person's head is at. Netflix should be prosecuted for indecent exposure for recommending inAPPropriate Comedy to any decent comedy lover. 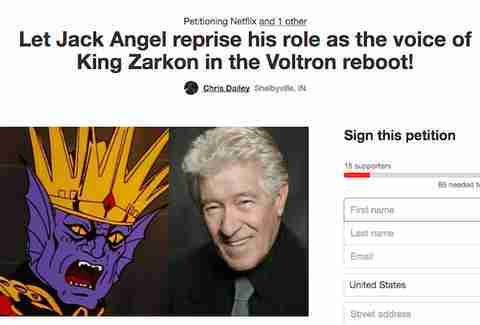 Let Jack Angel reprise his role as the voice of King Zarkon in the Voltron reboot! Argument: "Help us get his voice herd!" Reality check: Because it's not really Voltron without THE King Zarkon. Matt Patches is Thrillist’s Entertainment editor. He previously wrote for Grantland, Esquire.com, Vulture, The Hollywood Reporter, and The Guardian. He's petitioning Netflix for a Quantum Leap sequel series. Find him on Twitter: @misterpatches.